Even though the opening for the new DFW Alamo Drafthouse won't happen until May 2013, the owners are taking no time in building up the excitement. Located at the corner of Beltline and 75, a forgettable, mid-century modern strip mall is soon to be taken over by movie lovers. As its first official event, the guys brought a Rolling Roadshow event to the parking lot across from where the new theatre will be built. The Drafthouse Rolling Roadshow is an arm of the theatre that brings movies to the outdoors to famous locations. Here we were treated to a 35mm screening of THE BURBS. The area was sectioned off with a chain link fence and was a BYOC (Bring Your Own Chair) event. Inside were four different food trucks, a local pizzaria serving $2 slices, and local bar, Lee Harvey's, pouring six different beers from four local breweries (Deep Ellum, Peticolas, Lakewood, and Cedar Creek). About 30 minutes before the film started, in true Drafthouse fashion, one of their famous pre-shows appeared onscreen. I would be curious to hear from someone who had never been to a Drafthouse movie before, and what they thought of their pre-show instead of the standard commercials the more corporate theatres show. Right at 7pm, we were then entertained with a few different games related to the film. First, there was a pajama contest for anyone who came in PJ's. Then four contestants came up and enjoyed a sardine eating contest for a bag of swag. And finally, which was my favorite, they had a big dude and a team of teenage girls compete in seeing who could beat the most crap out of an aluminum trash can. That's something that makes the Drafthouse so endearing. The thought and planning that goes into special events like this. Even though I didn't fully understand why the games related to the film, I knew after I watched the film that I would be in on the joke. After getting us in the mood, it was finally time for THE BURBS to start. Well, almost. For their "upcoming attractions", instead of showing individual trailers for films, the Drafthouse creates a mashup of upcoming films from their specials to big openings. All I could do was sit in my lawn chair and fume with jealously because our theatre isn't open yet. Then, they showed their famous bumper warning what will happen if you talk or text during a film. I actually thought about this before the event and wondered if they would show that warning. Since the film was showing outside and plenty of people brought children and dogs, I didn't think they would show it. Surprisingly, everyone seemed to respect their policy, and I rarely heard any chatter from anyone except a random child off in the distance or a food truck calling someone's order out. That makes me very happy that DFW will take the Drafthouse rules seriously. 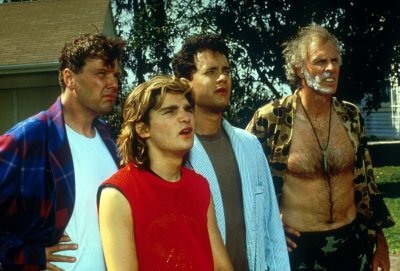 THE BURBS was a fun 80's film. I forget there was a time when Tom Hanks was a comic actor. The film is about new and mysterious family who move into the suburbs, and the local neighbors take it upon themselves to figure them out. The cast is full of great characters like the disgruntled, can't-quite-let-the-war-go army guy, the best friend who has great one-liners, and the crotchety old man who lets his fluffy dog do his business in other people's lawn. They're crazy, but they're the neighborhood, and you have to stick with the people on your block. So obviously hijinks ensue and antics get out of hand in the quest to figure out the mystery of the new neighbors. Overall, this was an amazing first event for the new theatre. The atmosphere, though a bit chilly from the wind, was comparable to all the other Drafthouse events I've been to in Austin. Hopefully the word about this theatre and their mission will spread like wildfire now. Because I will tell you, having just one Drafthouse in the DFW area will not be enough. i thoroughly enjoyed the beating of the trash cans! And I hope it's appreciated as well. If Friday was any indication, I think it will be.